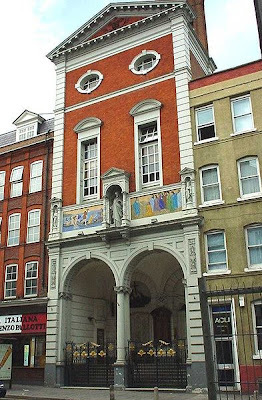 There have been Italians in London for hundreds of years, and the population started to rise significantly in the 19th century. 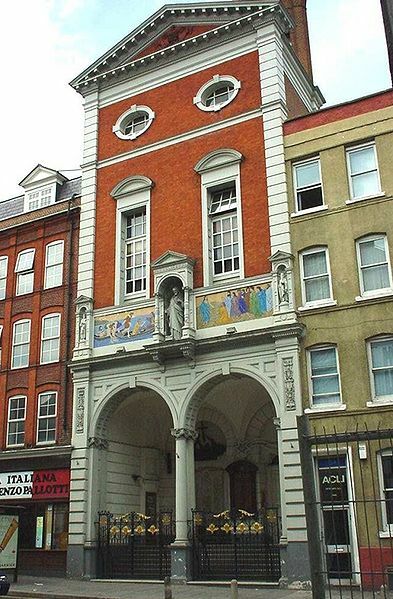 By the middle of the century, around 2,000 Italians had settled in the slums around Clerkenwell, and a Roman Catholic priest decided they needed a church. St Peter's opened on 16th April 1863, operating as a church for all Catholics in the community, with a distinctly Italian look and feel. Designed by the Irish architect Sir John Miller-Bryson, using plans drawn by Francesco Gualandi of Bologna, modelled on the Basilica of San Crisogono in Trastevere, Rome, the church was originally the only one in the country in the Basilica style. St Peter's offers lunchtime services on weekdays, with other services on Saturdays and up to four on Sundays. There are also various other community groups and an annual pilgrimage to Aylesford, Kent. I wandered past on Christmas Day about lunchtime, and although it is an unfortunate stereotype, all the Italians in their finest suits did look rather like a scene from The Godfather. I am ugly, fat and want to kill myself. Help. Hi Anon 20:56. Hard to know if your comment is genuine or not, but if it is you should definitely talk to someone. Try The Samaritans. A good friend used to volunteer for them and they are all genuine people who want to help people who are struggling with things.